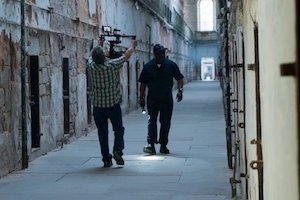 American University School of Communication professors Maggie Burnette Stogner and Richard Stack know that capital punishment is not a simple subject, and their forthcoming documentary film, In the Executioner's Shadow, shows why. It tells the stories of people who have personal experience with the death penalty, from crime victims to a former executioner. Through their eyes and stories, the film navigates the moral quandaries of capital punishment, and larger issues of American identity, fairness and the criminal justice system in our nation. Stogner said, "It's about who we are as a country and what our values are in the 21st century." "In the Executioner’s Shadow” now has broadcast deals in Spain, Portugal, Russia, and Australia thanks to their Distributor, Sideways Film. More broadcast contracts are in the pipeline. To date, the film has won the IMPACT DOCS Special Award of Excellence, Best Short Docs Award, and the Houston World Fest Remi Award. A portion of the film will be screened along with a panel discussion at the Bleakhouse Publishing Annual Event with National Coalition to Abolish the Death Penalty at American University on September 26. It will also be featured at the (In)Justice for All Film Festival and the Chesapeake Film Festival in October. Stogner, a filmmaker and professor of film and media arts, and Stack, a strategic communication professor, have worked with several students and alumni on the project over the course of production, and it's in the final stages of production. (L to R) Elizabeth Herzfeldt-Kamprath, Maggie Stogner, Rick Stack, Mary Alice McMillan at Fresh Docs. On April 11, as a SOC Signature Series Media that Matter event, they showed clips of the film with a panel that Stogner and Stack were a part of and included Diann Rust-Tierney, Executive Director of the National Coalition to Abolish the Death Penalty, Vicki Schieber, activist and mother of murder victim and Jerry Givens, former chief executioner of Virginia. The film will debut in full later this year. Their hope is that the film will spark dialogue about understanding justice. "We've discovered through our various interviews that one side talks past the other. It's a mutual predicament. And we're trying to get people to talk to each other," says Stack. The film was screened recently as a work-in-progress at a Fresh Docs event sponsored by the Center for Documentary Studies at Duke University and the Southern Documentary Fund. The response, Stack said, was overwhelmingly positive. The film was also highlighted by Stogner when she was interviewed on WAMU 88.5's The Kojo Nnamdi Show on the state of documentary in DC. Stack said they have received a lot of support from key institutions within the anti-death penalty community, who have expressed interest in screening the documentary to their membership. The team is discussing screenings with the National Association of Criminal Defense Lawyers, Amnesty International, the NAACP and the National Coalition to Abolish the Death Penalty.